Most Hong Kong people are suffering from neck pain and low back pain deal to their improper posture at work and in everyday life. We are devoted to enhance people's awareness on spinal wellness by providing health talk and spinal screening services for corporations and organizations. All health talks are delivered by our centre's chiropractor and physiotherapist and followed by a spinal screening session, providing consultation for participants. 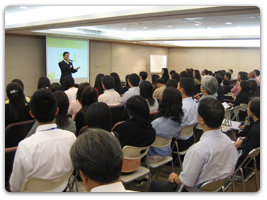 We have organized over hundreds of health talks for corporations, associations and education institutes and received positive feedback. Please kindly choose the following health talk topics or suggest other related topics to suit different needs.